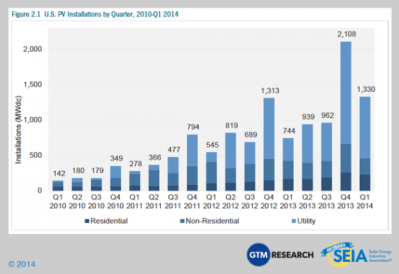 There has been a rapid rise in solar installations in the US over the past 5 years. There are a variety of reasons for this, including the sharp drop in the cost of solar panels. However, there is no question that the introduction of the solar leasing model – where consumers and businesses can get PV systems installed with little or no money down – has also played a significant role. 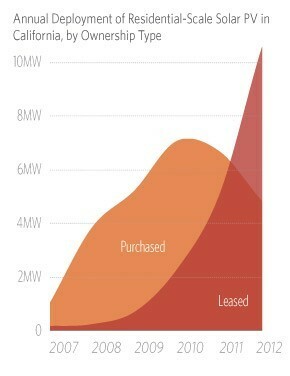 This is evidenced by this graphic, showing the meteoric rise of residential solar leasing in the California market. companies have always been able to finance energy efficiency projects just as they can any capital project. However, this type of financing does not offer the level of convenience of solar leasing, where consumers need deal with only a single party to handle installation, financing, and all of the paperwork involved. Also, traditional financing models have not generally taken advantage of the uniqueness of energy efficiency, where investments translate into immediate savings. Lease it and they will come? Recently, financing options specifically focused on energy efficiency have become more common, creating more options for companies looking to make energy efficiency improvements. For example, GSG Energy Finance offers an “Energy Efficiency Lease”. Greenavise terms their program E3L, for “Energy Efficiency Equipment Leasing”. An interesting twist on this model is the recent launch of a crowdsourcing financing service specifically for energy efficiency: Spark Fund. Whether this will become a meaningful source of energy efficiency finance remains to be seen. Another new approach is vendor self-financing. For example, at Powerhouse Dynamics we offer an “Instant Payback” program, allowing customers to gain access to ourSiteSage enterprise energy & asset management system for little or no upfront cost. In addition to affording customers the ability to start seeing net savings almost immediately, this program has the added benefit of enabling customers to interact with just one company and not worry about finding financing on their own. There are other types of programs that accomplish similar aims. PACE (Property Assessed Clean Energy) allows property owners to pay for energy efficiency and renewable energy improvements over time through an increase in their property taxes. On-Bill Financing spreads the payments out on the utility bill. These programs are beginning to expand, but they are limited to those specific states that have enabled them. There has been enormous growth in energy efficiency implementations since the 1973 oil embargo triggered the first state and utility efficiency programs. Since then companies have become more familiar with energy efficiency as a business tool to improve profits. New financing options should help further spread the penetration of energy efficiency in US companies. Interested in learning more about SiteSage financing?